Based on 4338 customer ratings. Don’t let a trip to Chicago pass by without trying the best pizza delivery and restaurant in town. We’re also convenient to the Rosemont Theatre, the Allstate Arena, River’s Casino and MB Financial Park. 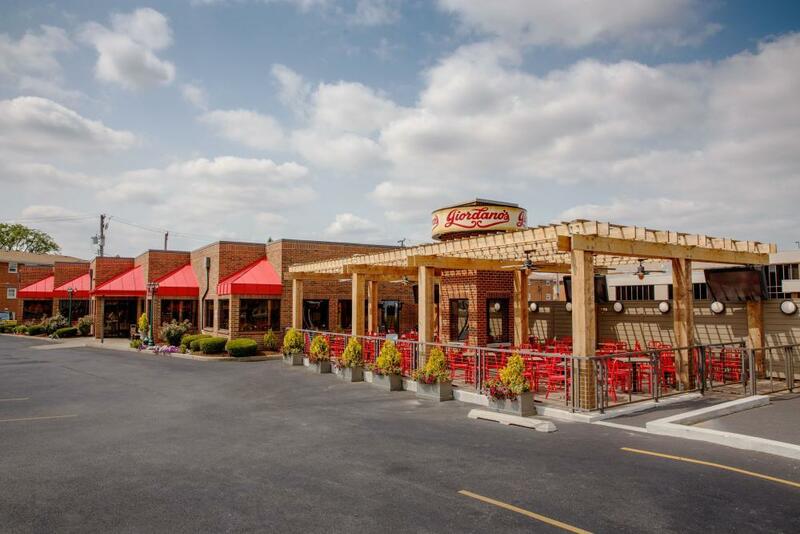 Whether you relax in our full-service dining room or nestled up to the fireplace on our patio, you’ll love Giordano’s! We even have a private room for a one-of-a-kind event. Prefer pickup or delivery? Order online for easy convenience. Whether you’re heading out of town after a busy business trip in Chicago, or you spent the day at the convention center and are ready to taste the best deep dish pizza in town, Giordano’s is your destination! Our convenient Rosemont/O’Hare location makes it easy to eat at the best pizza place in Chicago without going out of your way. With a 40-year reputation for outstanding artisanal deep dish pie, make the most of your trip to Chicago — and come to Giordano’s! Old-world Techniques. The Best Crust and Ingredients. That’s Giordano’s! There are six reasons why Giordano’s is the best pizza delivery and restaurant in Chicago: It takes six trained craftsmen to build just one Giordano’s pie, and you can taste the heritage in every single bite. Giordano’s also uses the fluffiest mozzarella, the ripest vegetables and the most flavorful meats — baking these ingredients slowly in the flakiest, pie-like crusts. All it takes is one pie to discover why Giordano’s has earned its reputation as the best pizza in Chicago! While our pizzas are famous, we also have a celebrated full menu, featuring mouthwatering pastas, hearty specialty sandwiches and the freshest salads along with zesty appetizers! Check our menu and see for yourself. Going gluten-free? We have delicious options for you, too!